In the middle of a workday where the Expedition 53 crew performed a routine emergency drill and additional ocular ultrasounds to map any eye changes, there was, most certainly, a higher (phone) call that actually came from more than 200 miles below the International Space Station at the Vatican: Pope Francis phoned in. It was no ordinary ESA (European Space Agency) in-flight event. Though the Pope did ask the requisite question—what motivated them to become astronauts/cosmonauts—the conference delved quickly into deeper topics, like the crew’s thoughts of humankind’s place in the universe. Each crew member took turns speaking to Pope Francis through ESA astronaut Paolo Nespoli of Italy, who translated. Nespoli indicated that while he remains perplexed at humankind’s role, he feels their main objective is enriching the knowledge around us. The more we know, the more we realize we don’t. Part of space station’s ultimate mission is filling in those gaps and revealing the mysteries locked away in the cosmos. Cosmonaut Sergey Ryazansky of Roscosmos told the Pope that it was an honor to continue his grandfather’s legacy aboard the orbiting laboratory. Ryazansky’s grandfather was a chief engineer of Sputnik, the world’s first satellite to launch to space. Ryazansky said he is now part of the future of humanity, helping to open frontiers of new technology. Commander Randy Bresnik of NASA spoke candidly to Pope Francis, saying that one cannot serve aboard the space station and not be touched to their soul. From Bresnik’s unique vantage orbiting Earth, it is obvious there are no borders. Also evident: a fragile band of atmosphere protecting billions of people below. 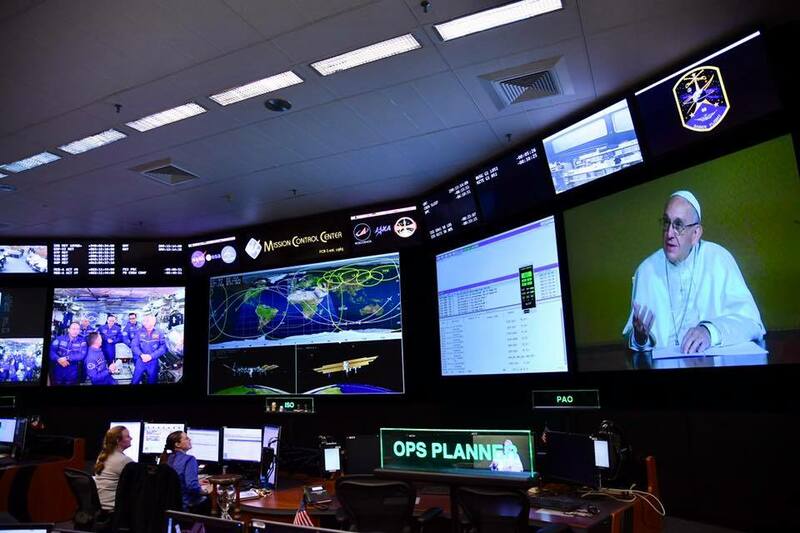 Pope Francis said that while society is individualistic, we need collaboration—and there is no better example of international teamwork and cohesiveness than the space station. It is the ultimate human experiment, showing that people from diverse backgrounds can band together to solve some of the most daunting problems facing the world. “The totality is greater than the sum of its parts,” Pope Francis observed. At the end of the call, the Pope thanked his new friends, offered his blessings and asked that they, too, pray for him in return. Bonne nuit à vous deux bye oxo. Two approaches (religion and science) in the effort to understand ourselves and the World. Can you fix your RSS feed for this blog please? It is invalid RSS XML at the moment, so could be your WordPress installation at fault. Thank you! Thank you. The issue is being worked on right now. It must have been quite an spiritual experience to speak from the ISS with Pope Francis, the highest Pastor of the Catholic Church on Earth. Orbiting in an spacecraft and being able to watch the whole planet from space must be, by itself, a fascinating and humbling experience for the astronauts on board the ISS. They all somehow represent us; they all are our Ambassadors to the universe. Es esencial conocer las opiniones de ambos lados, de lo espiritual y de la ciencia. Y nunca retarse uno a otro , en la medida que sea necesario compartirse y felicitarse por ambos. recordará esta audiencia desde la distancia con mucho cariño y bendiciones para que les vayabiensus experimentos, trabajos y actividades. El viaje para ver al Papa Francisco fue cortesía de mi madre y fuimos juntas con un grupo de Puerto Rico. El viaje para ver al Papa Francisco fue invitación de mi madre y fuimos juntas con un grupo de Puerto Rico. Le deseamos mucho éxito a expedition53.